"The 77-year-old designer and former grande dame of Palm Beach entertaining—in the Sixties and Seventies, her kitchen sat 26 for dinner—awaits guests perched on a chinoiserie-covered bench. She wears white slacks and a vintage Lilly shirt printed with white and yellow daisies, her feet bare but for the bright coral polish on her toes," describes a new W magazine profile. Everybody knows Lilly Pulitzer prints — the pink and green WASP uniforms that have signified Palm Beach privilege for half a century. Most of us would never wear them — but there's something compelling about this quintessential story of privilege, independence and success. And Lilly Pulitzer herself — brisk, eccentric, sans underpants — is a character for the books! 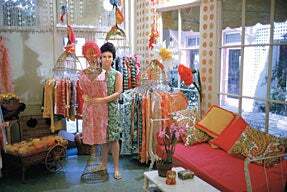 Lilly Pulitzer herself had a textbook background: Chapin, Miss Porter's, marriage to a publishing scion, and a youthful life of wealthy eccentricity (Pulitzer is famous for going without shoes and undies and for keeping a menagerie as a young wife.) Then came anxiety attacks, a stay in what she terms "the nuthouse" - “I can’t really remember how long I was there, but my cousin was there too, so that was nice” - and depression that led to the start of her "hobby," running a juice stand that called for a practical uniform of shift dresses that wouldn't show stains. The rest is, of course, history: the gaily printed shifts became a sensation with the Palm Beach society set, former classmate Jackie Kennedy wore one in a magazine spread, and Lilly Pulitzer became a household name, selling not just pink and green dresses, but embroidered trousers and capris, sarongs, and all manner of sportswear. Pulitzer is often credited with creating the concept of "resort" - or, as she blithely put it, "it’s always summer somewhere.” Although she closed up shop in the businesslike 80s, she sold the brand in 1993 and has continued as a creative consultant in its new incarnation. The line currently has 20 boutiques, plus department store collections. According to today's WWD, "brand extension is a significant part of the growth strategy for Lilly Pulitzer as it begins its second half-century." Of course, was Lilly Pulitzer really ever anything but a lifestyle brand? Did people ever really love wearing luridly-colored monkeys and sea-horses? Yes, the prints were cheerful, but when you see a Lilly Pulitzer, you think "Lilly Pulitzer" and that has surely always been the point. To wear one of her dresses was to momentarily be a part of a world where sporting goofy, unflattering clothes is a mark of dashing, privilege-bred confidence, the very definition of the uniform of an insider. Its appeal now is nostalgic. As W puts it, "the Palm Beach social swirl that Rousseau recalls—in which counts sat next to carpenters at her dinner parties and, as she relishes telling, Kennedy spoon-fed John-John on her kitchen floor—has an almost mythic quality, one she laments no longer exists." But to most of us, the nostalgic appeal is at least as much for a character like Pulitzer's as for anachronistic high society. She was, of course, inseparable from that privilege, and hers was a success inexplicably linked with her connections, friends, and lifestyle. But the old-fashioned no-nonsense sense of entitlement is also what allowed Pulitzer to build a successful business in a man's world, divorce her husband and move out on her own, where many women would have been happy to leave dresses as a pleasant sideline to a socialite's life. She took her lifestyle and made it a business. Everything about her story — from the world that inspired it, to the entitlement that encouraged it, to the scope of the achievement — is part of a long-gone world. This, as much as the unapologetic silliness of the clothes themselves, is a fascinating glimpse to another time for the rest of us.